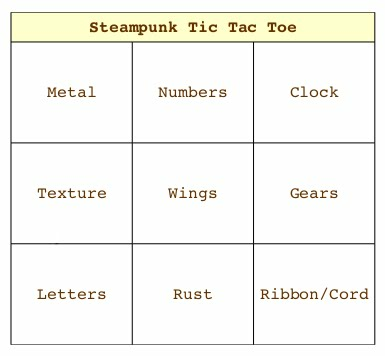 This week over at SanDee&amelie Steampunk Challenge is Steampunk Tic Tac Toe. It is the first time I have entered this challenge as on one of my leisurely trawls over blogland I came across this blog and thought it was FAB! I have chosen Metal, Wings and Ribbon. Firstly I got an old block I have had for ages and painted in with white gesso. On top of this I sprayed Cosmic Shimmer Sprays in blues and let it dry. I then added a stencil from Artistic Cellar called straight. I dabbed Versamark through the stencil and added WOW ebony embossing powder on the top and heat set to form her face. 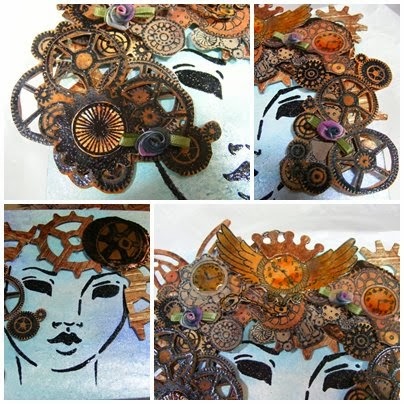 I then stamped out onto white card steampunk cogs from Paper Artsy and Personal Impressions then added Distress inks in rusty hinge, walnut stain and old paper over the top of Versamark heat set with WOW ebony embossing powder. I then cut these out and piled them on top of Grungeboard Tim Holtz cogs again inked in the same way. The metal I used is craft metal stamped out in Stazon a Deep Red stamp called Heavy Gear, and again cut this out. All the cogs were glued onto the block with Pinflair silicone glue. The wings are made out of grungeboard and are the smaller butterfly wing from the Tim Holtz Alterations Die. Then inked with the distress inks as before. I added 4 ribbon flowers for a little bit of femininity. I have highlighted the clocks with Crystal Lacquer. ← “Fashions fade, style is eternal.” — Yves Saint-Laurent…. WOW! She looks reaaaally reaaally fab! LOVE her hair, Sue, and the fact that there's so much detail to see.